A cataract is a partial or complete loss of transparency i.e. clouding, of the natural crystalline lens that we are born with. This cloudy or hardened lens can no longer produce clear, sharp images the way it used to. Although cataracts can occur at any age, they are most common among people over the age of 65. Cataracts can also be caused by trauma, heredity, diabetes and even some medications. 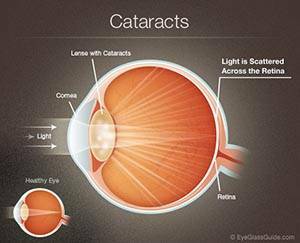 Cataracts progress at different rates and can affect one or both of your eyes. Though they can significantly reduce the quality of your eyesight they generally will not harm the eye. During your comprehensive eye examination the crystalline lens of your eye is carefully viewed through a dilated pupil to check for any opacities, yellowing or distortions. The quality of your vision in conjunction with the appearance of the lens is then evaluated as to how the cataract may be affecting your eyesight. Please read more under Cataracts Testing & Treatment about what tests you may expect while in our office. If it is determined that the cataract is the source of your decreased visual function, cataract surgery may be recommended. Fortunately, with today’s modern medical technology, your cataract can be treated safely and effectively through a microsurgical technique and implantation of an intraocular lens (IOL) which replaces the natural crystalline lens. Cataract surgery is an outpatient procedure that has restored the vision of many people. In fact, it is the most commonly performed surgical procedure in the United States. With today’s technology, patients can actually look forward to not simply regaining vision, but possibly having better uncorrected vision than they have ever had. In addition to providing standard cataract surgery and standard single vision IOLs, Dr. Kalski is one of the few doctors in the United States performing Custom Laser Cataract Surgery. He also been a pioneer in the use of the Advanced Technology Implants, including Restor, AcrySoft Toric and Crystalens. Please read more about your Cataract Surgery options.